A "wild west" tale of two brothers who batte both the state and a mafia empire in 1920s Italy, from famed Italian author Andrea Camilleri. Raffadali, province of Agrigento, 1920s. The Sacco brothers are free men with strong ideas about socialism and the State. Their lives change radically one morning when their father, Luigi Sacco, receives an anonymous letter from the local Mafia demanding protection money and is the victim of a robbery attempt. Luigi tells the police of the extortion letters he received, but the police don't know what to do: no one in the village has ever dared denounce the Mafia before. From that moment on, the Sacco brothers must defend themselves: from the Mafia and the forces of order, from their collaborators, traitors, and from the village's leaders, as they are assailed by murder attempts, false accusations, and false testimony. 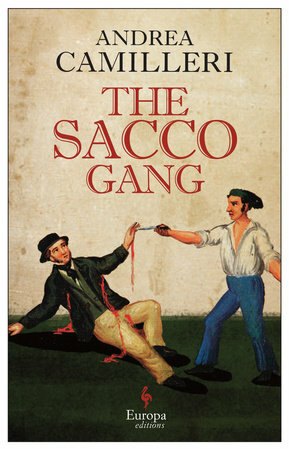 Through the tale of the Sacco brothers and what happens to the town of Raffadali, The Sacco Gang makes clear that not only does the mafia kill people, but it can also condition and irreparably devastate people's lives.